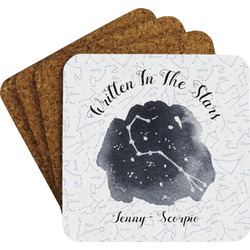 Personalized coasters are an optimal way to keep unwanted water stains off your home surfaces. They protect your coffee table and night stands while subtly blending in with your decor!! The unique designs and personalizations let you customize to your hearts desire and you'll no longer have to be the hostess nagging guests to use a coaster; these will stand out just enough to make them want to. The coasters are laminated on the top which gives them a refined appearance while the cork bottom keeps them from moving around. When the coasters are not in use slide them into the rich wooden stand where storage meets style. The wooden stand also has non-slip pads to prevent it from sliding around.